Will a Freshstart Adjustable Bed Help My Condition? AS is the fusion of the bones and inflammation of the vertebrae, discs and related ligaments. Getting the correct support to the spine whilst sleeping can help with this condition. Our adjustable bed system and massage therapy system can help support your spine correctly. Many people have felt the beneficial effects that our massage system can bring, it can help alleviate pain from the two main types of arthritis being oesteo (joints) and rheumatoid (ligament and soft tissue). There are over 200 types of arthritis so a test drive to see if it helps is a must. 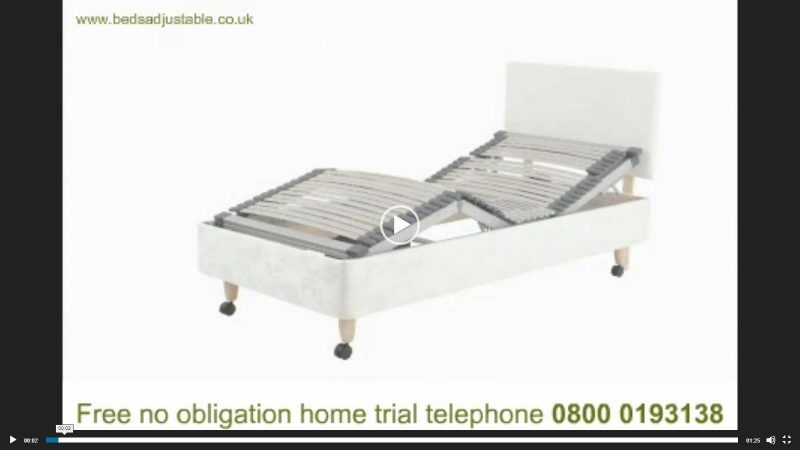 Our adjustable bed system can put you in the correct position to help ease pain due to arthritis. Elevation of the upper body while laying on your back can help relieve strain on the lungs making it easier to breathe, laying flat on your side can cause lung squeeze making it much more difficult to breathe. Our adjustable bed system can put you in the correct position to help ease your breathing. Breathing difficulties due to fluid build up in the bronchial passage. Elevation of the upper body can help bronchial drainage and along side our massage therapy system can be very effective in helping patients to breathe easier. Cold feet / hands or numbness are generally symptoms of poor circulation. This is caused by a lack of blood for the metabolic needs in that area. Raising your legs above your heart to help circulation and using our massage therapy system along with traditional methods may help this condition. This condition is another chronic respiratory ailment which is helped by acute elevation of the upper body. It is normally caused by smoking. If the condition is combined with bronchitis this is known as C.O.P.D. Chronic Obstructive Pulmonary Disease. Our massage therapy system can be very effective in relaxing the helping emphysema patients to breathe easier. Sliding hiatus hernias are the most common. These are small hernias that slide up and down, in and out of the chest area. The sphincter (ring-like muscle) at the bottom of the oesophagus and top of the stomach pushes through the hole (hiatus) in the diaphragm. The acid can flow up the oesophagus causing a burning sensation and can lead to scarring. Elevation of the upper section of your bed can help reduce the flow of acid into the oesophagus reducing burning helping you get a better nights sleep. A leg ulcer is where the skin breaks down allowing air and bacteria to get into the underlying tissue. Most common cause is poor circulation to the legs and feet. Our adjustable bed system can put your body into this position. Pain usually caused by wear and tear, falling, accidents, spondolosis, sciatica and many more causes. This is normally categorised as either muscular or skeletal pain. Muscular pain or soft tissue damage takes time to heal as blood flow to the back is very limited. Our massage therapy system helps relax muscles increasing blood flow and circulation, this can be targeted to the affected area. Our Empress Deluxe Frame has independent movement on the ankle compared to the knee which can pull open the lower vertebrae releasing tension and can be a great relief for most back pain including Sciatic pain. We are the only direct seller of this mechanism in the UK. If you want relief from any of these conditions try us first. MS interferes with messages between the brain and other parts of the body because of damage to the protective sheath around the central nervous system. The condition is unpredictable and many people have “bouts” and then remission while for others it is progressive. Our adjustable bed systems and massage therapy can help with the relating bed sores and will help support the body properly by use of the semi fowler position (slight elevation of head and foot section). Parkinson’s sufferers do not have enough dopamine because some nerve cells have died in their brain, movement becomes slower and it takes longer to do things. 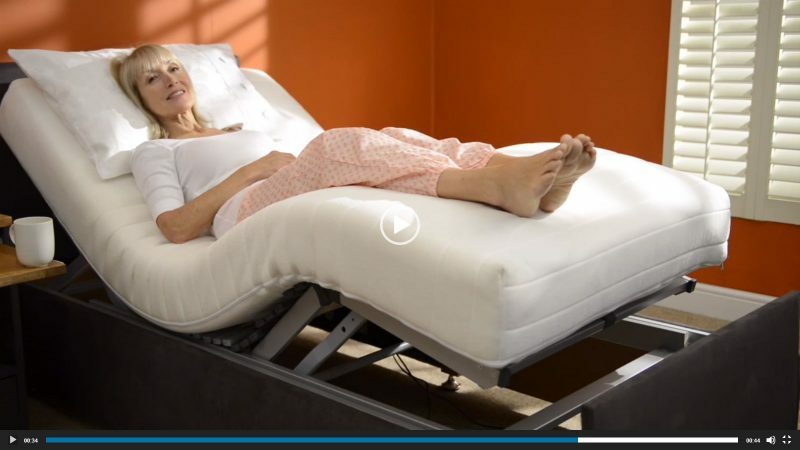 Our adjustable bed can make patients more comfortable by giving correct support and helping relax muscles improving circulation with our massage therapy system. Cervical spondylosis, a chronic neck condition normally due to wear and tear of the discs and bone in the neck. Incorrect alignment of the neck whilst sleeping can cause severe pain. Our Empress Deluxe mechanism has independent movement of the neck section which can be crucial to get the correct alignment when sleeping. We are the only direct seller of this mechanism in the UK. Stroke sufferers may lose the use of limbs down one side of their body (paralysis) due to a blockage by blood clot or fat globule travelling to the brain. Many patients find help by using the bed to adjust their position to give support and leverage when moving in bed a real benefit. Our adjustable bed (Empress mechanism) can put your body into more positions than any other adjustable bed system. Veins in the legs returning to the heart pump blood into chambers. This is where valves hold the blood until the heart pumps again opening the upper valve allowing blood into the next chamber where the valves are broken this allows the blood pool back into the previous chamber and expand the vein. By raising your feet above your heart this allows the blood to flow easier through the chambers causing less strain. Our adjustable bed system can allow your feet to be above your heart – this massage is not suggested for use with a pace-maker. The statements above are general definitions and do not mean that every sufferer of any particular condition will benefit from our products. We strongly recommend the person tries the product on a free trial before deciding whether to purchase or not. Is your condition not listed above? If your condition is not listed above, please contact us for more information.